Volvo continues to raise the bar each year on its venerable global brand. New for 2019 is a luxury compact SUV guaranteed to please even the most discerning driving enthusiast. The all-new Volvo XC40 Momentum is sure to turn heads as it takes to roads everywhere with its distinct premium features. The standard Digital Drive Display measures a massive 12.3-inches, helping drivers to keep their eyes directly on the road as the pertinent driving data is display at sight lines. The patented 9.0-inch Sensus Touchscreen puts all of the necessary driving and infotainment tools right at your fingertips. You owe it to yourself to check out the new XC40 Momentum. 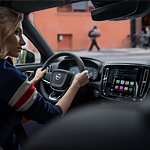 The Volvo experts at Principle Volvo Cars of San Antonio can't wait to introduce you to this premium compact SUV. Our friendly associates are eager to answer all of your questions and take you out for a test drive of this luxury vehicle.